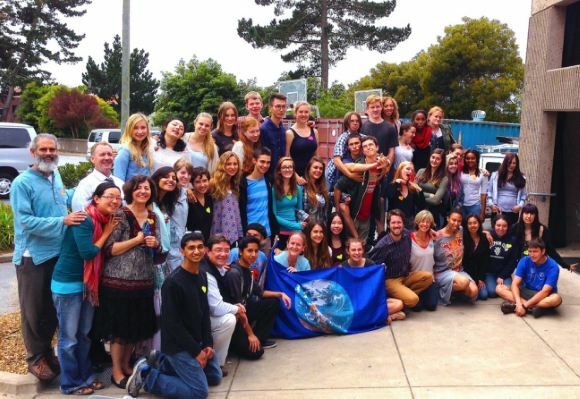 Kindness Day At SF Waldorf High School! From all angles of the Bay Area-- one car from Marin County, another from Fruitvale in Oakland, one from Mountain View and Berkeley-- our team of ten teens and adults assemble at the entrance of San Francisco Waldorf High School early Thursday morning. Veteran Humanities teacher and school leader, Joan, warmly greets us in the multipurpose room, where the chairs are already arranged in a circle for our morning Kindness Workshop. It all started over a year ago when Joan Caldarera asked her students, “Like Thoreau, what would you be willing to go to jail for?" The students could not answer, and Joan's response was to create a three-day orientation for the senior class on Thinking, Feeling, Willing. Earlier that Summer, Rahul had given a memorable commencement speech with resonant values for the school’s 2013 graduating class. So, at the start of last school year, a team of love warriors from the ecosystem joined forces with Joan to do a kindness workshop for the 2014 senior class. This Thursday, a new configuration of us joined in to do it again. 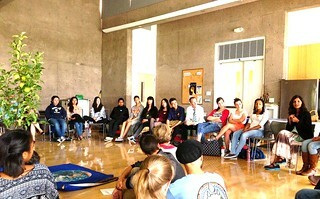 Before the students arrive, we ground ourselves in an opening circle of meditation and a recap of the flow for the day. As the students filter in, our amazing kindness youth Nidia, Emily, and Hanadi hand out paper heart nametags for each student. Pancho grounds us in a few minutes of silence, and Nidia and I welcome us all and offer up our intention for the day: to explore kindness. We do a round of name introductions, and everyone shares something that they are grateful for. Lahar opens us up with a story of her experience during a walking pilgrimage along the Narmada in India a few years ago. As they were walking, one student noticed how Gopaldada, an 87-year-old Gandhian, kept picking up stones on the path and tossing them to the side. When she inquired why, he explained simply that he wanted to leave the path easier for others behind him. By moving aside the larger stones in the road, he could do his small part in making someone’s journey a little smoother, and prevent any injuries that may have otherwise occurred from tripping or biking over the stones. Lahar’s take away was that it is such a small act, but Gopaldada’s gentle intention to serve those who would come after him—whether by a few minutes or a few thousand years—reveals the power of those anonymous, seemingly insignificant acts of kindness that can really make all the difference. Nidia shares how a kind request for “a smile” from a doorman she passes while walking to work lifted her out of a dark mood to reflect, “Hey, I’m on my way to work with children and what would it be like if I couldn’t greet the kids with a smile?” That day she made a point to smile at each child she met. It’s amazing how much difference a simple smile can make. Then she and Emily led an activity by pairing everyone off to discuss an act of kindness we've received. After a few minutes, we re-group, and go around in the circle as each person shares the story their partner had told them. Something powerful unfolds in that circle of sharing-- an opening up and realization of the many and varied unnoticed acts of kindness that fill our days. One teacher shared how his wife has greeted him each morning with breakfast and a candle for the last 20 years. A student shared gratitude for her parents' kindness and care in making breakfast and packing lunch for her every day. Hanadi reflected on how good it feels to get a hug, and recalled a time when she was having a down day and how it shifted when a friend simply gave her a hug. Another student had been stressed with thoughts of college and her senior year, and was put at ease with her father's accepting words to simply do what she can and not worry. From there, Nidia introduced the Free Hugs video, and we shifted into “doing” acts of kindness! Everyone grabbed a paper heart and wrote a note of encouragement. Each senior grabbed a flower, wrote a personal note and went out to the find a freshman to gift it to. We then divided ourselves into two groups: “Kindness Canvassers” and “Inner to Outer Sanitation” with an intention of spreading kindness beyond the walls of the school into the streets of West Portal! Within minutes the students were busily making beautiful posters and writing personal “love” notes of appreciation while others were grabbing brooms and trash bags. Once in the streets, men and women of all ages were overwhelmed with hugs, homemade cookies, smiles, flowers, and “love” notes! The joy was palpable! Hanadi (youth anchor) shares, “It was nice. I got to miss school (jokingly:)" and then she added, "I learned a lot more here than I do at school." Scott (faculty) reflected on running into two elderly women and offering them free hugs and smiles, and then he found out they were from the Arden Wood Assisted Living home next to the school, and that he had met them two years back at a school barbecue. So it was a familiarizing of neighbors and reconnecting with community. 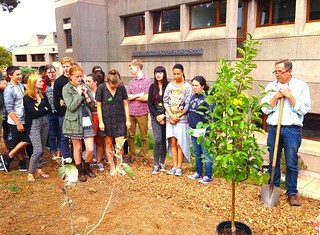 For SF Waldorf High School our volunteer is a beautiful pink lady apple tree. Inspired by Nimo’s pilgrimage and the story he shares of Johnny Appleseed of “planting seeds” - small acts of kindness everywhere he goes - is a perfect metaphor for Love in Action. This day, all 50 of us gather outside around the apple tree (with shovels and a kind Mr. Burkheart, the Botany Teacher at the helm). Together we bless the tree, it’s new home and send it all our love. Just last year, the school had experienced vandalism in the form of someone cutting down all the newly planted fruit trees to short trunks. Our tree planting takes on a deeper intention. The students begin to dig the hole, and spontaneously several girls start to sing. It’s amazing the beauty that unfolds in a heart-filled space. Scott, a history and economics teacher and friend of the ecosystem, is approached by three girls who want to start a Kindness Club and asked if he would be their mentor. They are excited at the prospects of doing a 21-day Kindness Challenge with the school. :) And Scott was especially moved because he had listened to a gnawing sense of misalignment and stepped back from being the Model UN advisor this year, to create space for something else. This fit perfectly with the values and direction that he would like to grow in. Ending with the tree blessing and planting brought a sense of the sacred to the day. Lahar and Vishesh end our circle around the tree with a devotional song ~ it was a soul-stilling ribbon that tied a bow around an incredible gift of a day. Once back inside, the students are all lined up patiently waiting to eat. We ask them, “Why are you waiting. Please go ahead!” They all respond, “We have been waiting for you. We will not eat until you are served:)” With a full heart, we receive their love and are gifted an abundance of tasty Indian food. We enjoy more conversation, laughs and connection! Anne ~ Gathering to meditate before the students arrived was powerful ~ we co-created a space to allow the day to flow organically, and each one of us facilitated as "ladders" in the circle. I was also amazed at the amount of reflection from the students, the depth and sharing was more than we have ever experienced. Sam ~ I am grateful for the teachers and staff. They are incredibly supportive, from the email communication to their participation in the Circle. That’s what makes a school! And they embrace new opportunities, offering their students a range of different experiences from bringing in a Massai Warrior to a Kindness Day! Nidia (age 15, youth anchor) ~ This senior class is incredibly close. Everyone talks to each other and supports each other. That’s my favorite part. Coming from a school where we have less kids, our senior class isn’t as close or as open to new experiences as this class. This is a “big picture” school, more than the “big picture” school I go to. 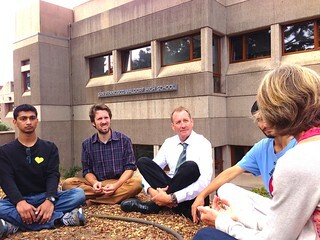 Scott (faculty) ~ You (the team) were able to bring the energy, authenticity, smiles and presence to the circle. We’re teachers. We can feel it. You “planted” the space in previous days…that’s what teaching is all about. It’s about preparing spaces and letting it just grow. So the three girls, wanting to start a Kindness Club couldn’t be more natural at that moment. Jose ~ I’m grateful to all be together. It’s been challenging coming back from India and keeping all that Love inside of me. It’s not easy… Being here is an infusion of energy. This beautiful experiment can blossom in the part of the Planet we call Spain. The way we create the space is so natural, organic and collective. Lahar ~ One of the students came up to me while we were making the posters and said, “I wish we could use natural resources instead of paper from the trees.” I replied, “Yes, thank you for your sensitivity and awareness.” It’s amazing! Pancho ~ We need to continue this! I noticed how you (Anne) facilitated our planning at Casa de Paz (even though everyone is so active) and you asked us to meet at 8am this morning. That was beautiful. Grateful for the pictures and writing this for a vicarious experience of it. Sounds like such a delightful event. Makes me wish that I were one of these students. Makes me wish that all students could experience this. Thank You Anne for such a thorough account!